Can Peg and Cat figure out the winning pattern? Can Peg and Cat figure out the winning pattern? Friendly competition between bunks at summer camp leads to a hands-on lesson in counting by fives and tens. It's summertime at Camp Niniwawa. 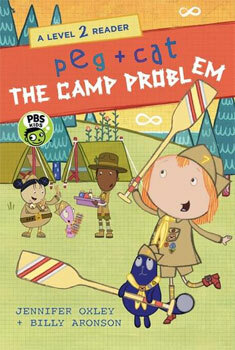 Peg, Cat, and their friends Aki and Richard are in the Gopher bunk " Gophers, they always go for it! Arts and crafts is a welcome distraction from homesickness for Richard, whose love of patterns helps him build a red-and-blue Popsicle-stick ladder. When the Raccoon bunk challenges the Gophers to a friendly battle of the bunks, it's on! Winning a contest earns a bunk ten points " but being a good sport is also important, and that earns five points. Can they get the hang of counting by fives and tens to figure out which bunk will reach one hundred points first? And when a tug-of-war lands the Raccoons up in a tree, can Richard's knack for repeating patterns solve the problem? Peg + Cat is the Emmy Award–winning animated TV series created by Jennifer Oxley and Billy Aronson and produced by The Fred Rogers Company. It was honored with a Parents' Gold Choice Award for Television in spring 2016.